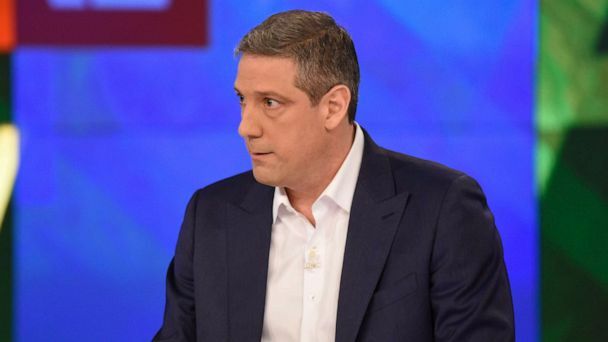 Ohio Rep. Tim Ryan, who jumped into the crowded 2020 presidential contest on Thursday, headed to his hometown of Youngstown this weekend to formally launch his campaign. The moderate Democrat, billing himself as a candidate who can unify the progressive wings of the Democratic Party with the more middle-of-the-road working-class voters, enters a field that has been primarily dominated by more progressive voices. Ryan, once a "pro-life" supporter, flipped his stance on abortion as he has moved further left over the years. Ryan kicked off his recently-announced presidential campaign Saturday by calling for unity and attacking what he sees as a set of false alternatives laid out by other politicians. It's a refrain he echoed earlier this week. "Our country has been divided for a long time," Ryan said on ABC's "The View" Thursday. "The first thing we have to do is unify." Ryan partly blamed Russia for political division in America. "If there is an incident in America that's controversial -- about kneeling for the National Anthem or there's a school shooting or there's an incident between a cop and a kid -- you know who comes on to our social media? The Russians. OK? I want you to hear this. The Russians. They come into our social media and they spin things to get us into these divided camps so that we're fighting with each other," he said. "That's what they want. And meanwhile, we can't get out economy going. Meanwhile, we can't get a healthcare system that works." Ryan several times referred to his working-class upbringing in Niles, Ohio and sought to use his every-man persona as a way to distinguish himself from other candidates. "The flyover states are my states. The flyover states are your states. And the flyover states are going to start governing in the United States of America again," Ryan said to applause. In making his 2020 run official, Ryan told a story of his daughter calling him a few weeks ago in tears because one of her friend's father was transferred from a local General Motors plant. "My daughter called me and she said, 'You got to do something.' And I said, 'I'm going to do something. I'm going to run for president of the United States. We're going to make sure this doesn't happen anymore,'" Ryan recalled. The newest White House hopeful, a day after announcing his presidential campaign, shifted his focus on race as he took the stage at the National Action Network conference in New York City Friday. He noted he grew up in a town where he "didn't know a lot of black people," before adding, "I represent the city of Youngstown, and the city of Youngstown is 50 percent African American, and the number one lesson that I learned is how much I did not know about the experiences of people of color in a community that was not that far from my own." Speculation began to ramp up around Ryan's 2020 plans last year after the eight-term representative started popping up in early key primary states including Iowa, New Hampshire and South Carolina. At the time, Ryan made it clear he wouldn't make a decision on whether to run in 2020 until after last year's midterm elections. "I think we've got to figure out what happens in November," Ryan said at the time. "The key is take the House back, play a role, be active." The Democratic moderate, who has represented Ohio's 13th district since 2003, had reportedly flirted with running for higher office in the past, including taking long looks at the Ohio governorship in 2014 and a run for Senate in 2018 before ultimately choosing to remain in Congress. Ryan gained national attention back in 2016 for his failed challenge to longtime mentor Nancy Pelosi over who should lead House Democrats. He also flirted with running for leadership again after Democrats took back control of the House of Representatives in 2018 before ultimately supporting Pelosi as speaker.